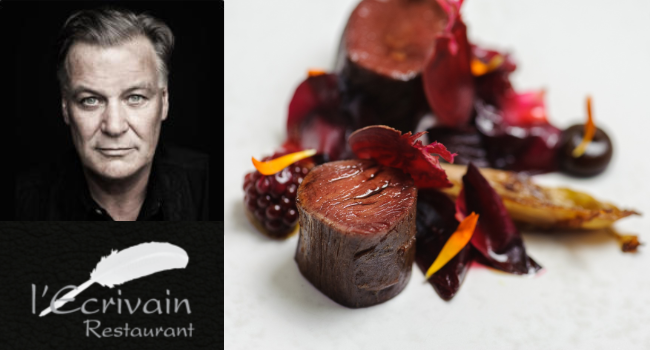 Spring has arrived, and with it a wealth of beautiful seasonal produce, to celebrate l’Ecrivain are delighted to offer TheTaste readers our wonderful Seasonal Menu for only €75 for two people. We look forward to seeing you – Derry, Sallyanne & all the Team @ l’Ecrivain. Today’s offer is your chance to dine in l’Ecrivain and experience 3 courses from their Seasonal Dinner Menu with tea or coffee and petit fours for 2 people for only €75, normally priced at €150. TheTaste are very proud to be partnering Michelin Star Restaurant l’Ecrivain. One of the very best restaurants in Ireland, Derry and Sallyanne have been delivering exciting cuisine and unforgettable dining experiences in their Baggot Street restaurant over the past 27 years, and all with personal service like no other. If there is one restaurant to treat yourself to this Spring this is the offer we would highly recommend. Over 27 years on, l’Ecrivain is going from strength to strength. – Valid from May 8th to June 29th 2017(Monday to Thursday) – vouchers MUST be redeemed within theses validity dates. – Advance Booking is essential to ensure you get your preferred date – It is advised to book on the day of purchase or at least two weeks in advance as there is limited availability. – Telephone bookings & bookings made via l’Ecrivain website will not be accepted with this offer. – This voucher is not redeemable at lunchtimes. – A 12.5% gratuity will be added to full value of the voucher (€150) and any extras ordered on the night.